MACROVITA SHOWER SCRUB SPA olive oil & birch 250ml - the best natural cosmetic available at www.ETERNEL.pl in category MACROVITA Olive Oil & Bee Royal Jelly Natural Cosmetics. We recommend! Shower Scrub SPA body scrub ideal for all skin types. The formula enriched with olive oil and birch extract. Perfectly cleanses the skin of dead skin cells and makes easier penetration of natural nutrients to the deeper layers of the skin. You save 13% (1,17 EUR). MACROVITA Shower Scrub SPA is a real feast for your body in the style of spa that now you can create by taking a shower. With unique ingredients, the skin is perfectly cleansed, moisturized and protected from harmful external factors. 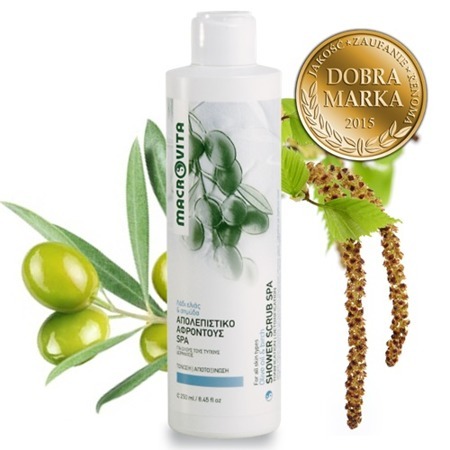 Scrub SPA brand MACROVITA removes dead skin cells, making the skin absorbs easier the nutrients of cosmetics MACROVITA, is perfectly moisturized, nourished, firm and full of natural light. Among the active ingredients we can find unique ingredients such as perlite, which allows the exfoliation of dead skin cells, which greatly accelerates the process of regeneration of the skin and makes it firmer. The content of natural ingredients reaches 93%. The formula without parabens, free from mineral oil (paraffin), petrolatum, propylene glycol, and without genetically modified plant extracts (GMO FREE). Importantly, fragrance used in is hypoallergenic. Peeling for everyday use. A small amount apply to the skin using hands, gently massage the skin in circular movements. Rinse thoroughly with water. Avoid eye contact. Product ideal for all skin types. MACROVITA Natural Cosmetics was founded in 1984. Below you may find the movie prepared on the occasion of the 30th anniversary of the MACROVITA company! Invite you to watch!